Domestic violence is a pattern of coercive tactics -- which can include psychological and emotional, social, financial, physical, and sexual abuse -- perpetrated by a family or household member, an intimate partner, or significant other, with the goal of establishing or maintaining power and control over the victim. Under the criminal process, it is a misdemeanor or a felony punishable by up to five years in prison, and any person convicted of domestic assault and battery may not possess a firearm for any reason, even work-related. Under the civil process, a victim of domestic violence may receive a Family Protection Order, which requires the abuser to stay away from the victim for up to 180 days. This order is enforceable in any state, Native American Tribe, or territory of the United States. Any person subject to a domestic violence protection order may not possess a firearm for any reason. You may question whether or not the actions of your partner or loved one is really abuse. 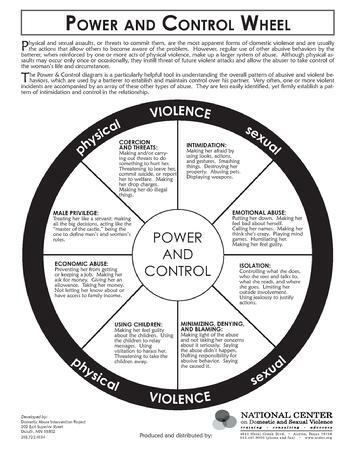 Please examine the Power and Control wheel below which identifies many different types of abusive and controlling behavior commonly used in domestic and sexual violence relationships.